Many people still remember the time when cars had a cable between the accelerator and the engine. With the hood up, any enthusiast could rev his engine simply by pulling that cable. Cars have an electronic accelerator now, and more and more electronics everywhere. 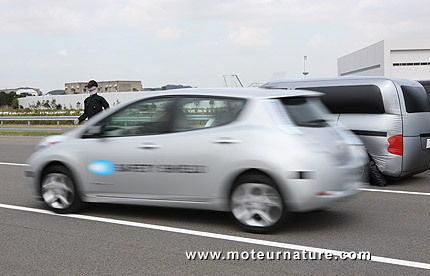 Electric cars have even more, and Nissan is clearly the leader in that field with its Leaf. But the manufacturer chose to go one step further, without asking anyone. Nissan has greenlighted steer-by-wire for a production model, a new Infiniti which shall launch next year. The technology is not exactly new, it’s been on concept-cars for more than 10 years. But few engineers ever thought it could appear on a production model. And we wonder what the engineers working on the GT-R sports car think of the technology. For non-drivers, the steering is the tool to order the car which way to go, but for enthusiasts, steering is the best’s friend. Steering is the car’s mouth, always talking to the driver to explain what’s going on. Driving on a paved road, or on a bridge when it’s windy, the steering will tell everything about it. And that is essential information! How does Nissan steer-by-wire system manages this? From the same vein, Nissan’s engineers have developed a safety feature, which it calls an autonomous emergency steering system. That device constantly scans the area on each side of the normal path of the car, and if an obstacle occurs so suddenly that an emergency braking would not avoid it, the system will first warn the driver, and take control if he doesn’t react, to steer the car away from the danger. That system is not yet approved for production, though. In terms of safety, it’s probably a good idea, but it’s another step to make the driver less and less responsible of his driving. We shall support every tech that makes a car greener, and the electrification of the automobile is clearly a positive step in that direction, but that doesn’t mean electronics everywhere is a progress.